Last year, the foundation received a grant from the Marcia F. DeVoe Fund at the Community Foundation for Monterey County which was used to put on the popular and successful Jules Tavernier Speaker series in collaboration with the Monterey Museum of Art. This series of three evening lectures was presented free to the public and saw a large turn out of interested residents and visitors. 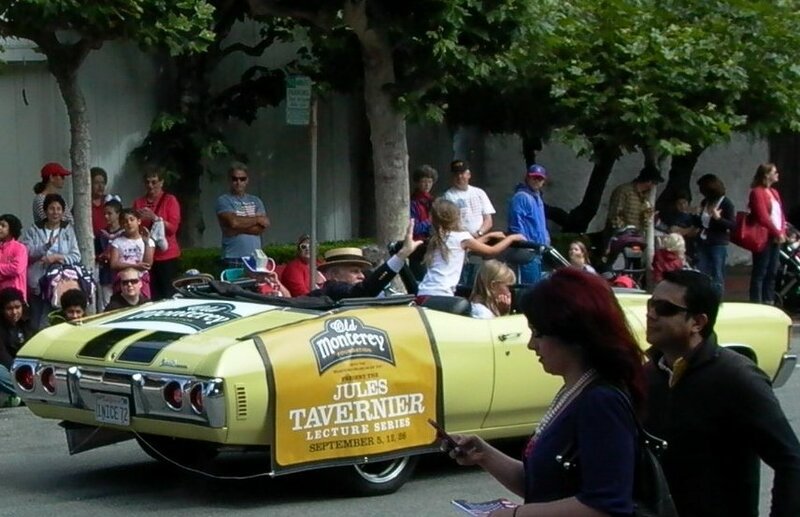 In the summer, downtown’s Annual 4th of July Parade saw the Old Monterey Foundation participating with a colorful classic car, decorated with banners from the foundation. OMF also helped out by handling donations and sponsoring Monterey County POPS! Concert at the Golden State Theatre. The following month saw a reappearance of OMF in downtown’s streets when there was a booth at the Old Monterey Farmers’ Market which was great outreach for the organization and helped inform residents and visitors about the foundation’s great projects and events. As well as reaffirming membership with Historic Monterey, the foundation also supported the National Trust for Historic Preservation in its plans for the Cooper-Molera Complex. Apart from events and sponsorship, the foundation began a PR campaign to raise awareness about Monterey’s parks and buildings, starting with the city’s Lower Presidio Historic Park Plan and use of California’s First Theatre. In continuing support of local artists and writers, the foundation also handled tax-exempt donations for the publication of the book Barbizon-by-the-Pacific: How Jules Tavernier, Jules Simoneau & Robert Louis Stevenson turned Monterey into a Vibrant Barbizon-Inspired Art Colony which is due to be published by the end of 2015. Last year was packed with great programs, and we look forward to seeing you at some of our exciting events to come in 2015!